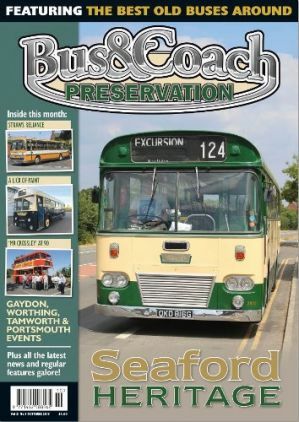 The latest news from the world of bus preservation and beyond. 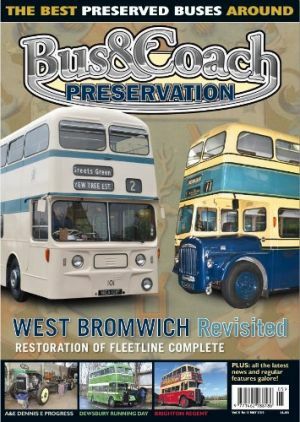 In a two-part feature, PHILIP LAMB takes a look at some of the latest developments at the Transport Museum, Wythall starting with the completion of West Bromwich 101, an MCW-bodied Daimler Fleetline. SIMON GILL looks at the substantial effort of organising and operating running days and explores what needs to be considered to ensure their survival. and pay tribute to days gone by . . . The German coachbuilder Auwarter’s distinctive and easily recognisable coaches first appeared on our roads in 1981 and have outlived all of our home-grown double-deck coaches by some years. Dennis E D235 (OT 8902) has started as DAVID JUKES finds out. former W Gash & Sons Roberts-bodied Daimler CVD6. 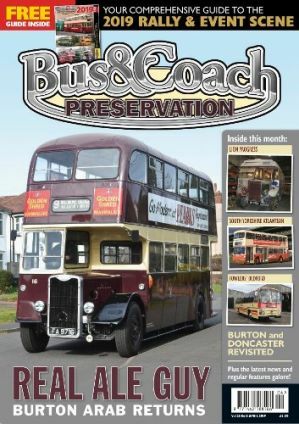 Atlas Editions Great British Buses — a review by NIGEL APPLEFORD. DAVID JUKES once again delves into the B&CP archive to present this month’s round up. special duty. NICK LARKIN reports. JASPER PETTIE continues the restoration story of former W Alexander & Sons P705 (WG 3260), a 1935 Leyland LT5A with 1946 Alexander bodywork. 1790 (JKW 290W), recently restored to SYT livery. ASHLEY BLACKMAN discusses cab restoration and how to be cab happy. NICK LARKIN visits a transport museum library with a difference and Poundland. A Bedford VAL seemingly a total wreck has been transformed into a magnificent example of its kind today. PHILIP LAMB reports. We couldn’t resist another round-up of Bedford VALs, so here goes . . .
of active mature buses and coaches. Over the years former coaches have turned up in a variety of roles. New Look bus, as DAVID JUKES discovers. AEC Regent. 486 (OV 4486). FUT 240V which returned to the road last year. A Southdown trolleybus (! 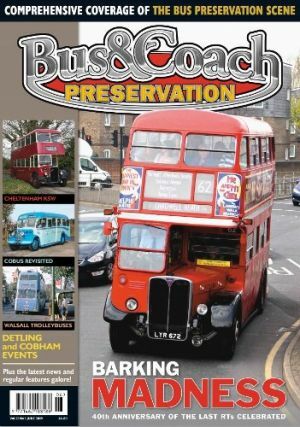 ), RT tributes, unusual Bedford OBs and a tasty snack are all among NICK LARKIN’S Off Route discoveries this month. of five historic vehicles as DAVID JUKES discovers. Citybus to divestment and sale to Transit Holdings. action on the UK’s roads. CHRIS WHITEOAK reports on a glorious celebration of a much missed North Yorkshire operator. vehicles. Words and pictures by CHRIS WHITEOAK. bodied Bristol MW6G coaches new in 1958. Sheffield JWE 416 and OWE 116 at the South Yorkshire Transport Museum. caught on film mostly in the 1970s. owner of Maidstone & District. blinds in the latest instalment of his restoration series. private hire vehicle and searching for a bus song. Over to NICK LARKIN. 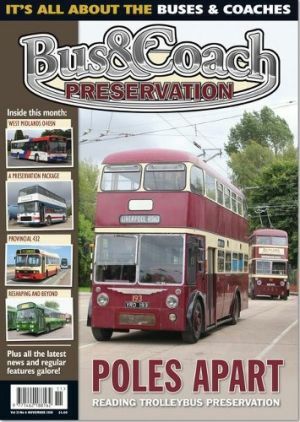 B&CP’s comprehensive advertising section, where you can buy or sell any bus-related item. This month’s round up examines several older vehicles extending their working lives in foreign climes and the UK. DAVID JUKES presents. Bourne vehicles to have seen service with another operator. NICK LARKIN finds them back home. TREVOR FOLLOWS takes up the story . . .
of Midland Red services within its area. Here’s a selection . 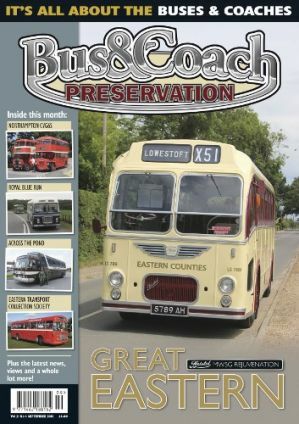 . .
SIMON GILL reports on the restoration of former South Yorkshire’s Transport 76 (B674 GWJ); one of the few surviving Dennis Dorchesters. regularly attend bus events across London and the south-east. We look at London Buses’ first Dennis Darts in the capital and with subsequent operators elsewhere in the UK. Eastern Counties-bodied Leyland Titan TD1, as ASHLEY BLACKMAN discovers. We look back at West Yorkshire across three eras — BTC, THC and NBC. Fewer Guys found their way into the non-PSV world than other makes. Pointer-bodied Dennis Dart MPD bus models. in London of recent times and pays tribute to South Shields. unique description as SIMON GILL reports. 30 September as SIMON GILL illustrates. trams remained to form the Blackpool Heritage Tram Tours fleet. these two Lincolnshire towns! We look back . . .
your vehicle’s exterior. ASHLEY BLACKMAN explains. NIGEL APPLEFORD examines Exclusive First Edition’s London Transport RC-class AEC Reliances, which proved somewhat disappointing in full-sized form. A search for a distinctive Reliance, a little bus nostalgia in Spain, and a nostalgic look at 1970s Manchester. NICK LARKIN reports. Reading’s trolleybus system. DAVID JUKES reports. coaches at work on the UK’s roads. Cambridgeshire concern. NICK LARKIN meets the man who made it happen. A brief look at Alder Valley coaches in the 1980s. A rare low-floor Mercedes-Benz O405N has quickly become a popular addition to the rally scene owing to its ease of access. SIMON GILL reports. A look back at West Midlands Mercedes-Benz O405Ns. vehicles representing local and neighbouring operators, plus others from further afield. A former First Provincial Leyland National 2 revisited some of its former haunts with NIGEL APPLEFORD. Group from Havant to Southampton in the late-1990s and early-2000s. day to celebrate the launch of a newly-extended service. SIMON GILL recorded the event. is studied by NIGEL APPLEFORD. tried to get youngsters on its side, and some pictures of drivers with a difference. NICK LARKIN reports. 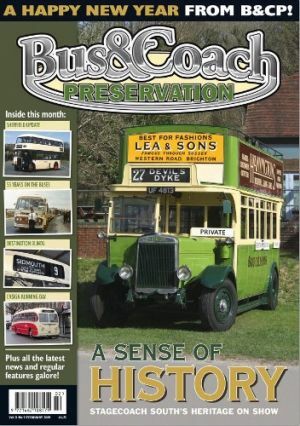 of East Sussex-based Seaford & District, as DAVID JUKES discovers. DAVID JUKES presents an assortment of senior vehicles at work in this country and beyond. NICK LARKIN meets TONY MELIA who joined Crossley Motors as an apprentice in 1942 and has more recently co-restored two important examples of the marque. cars from the 1960s onwards as MIKE GREENWOOD explains. 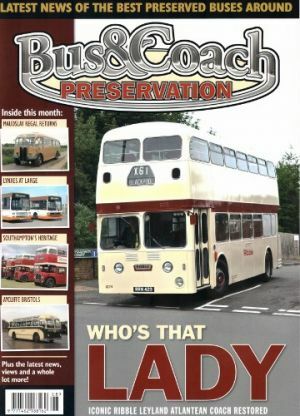 SIMON GILL reports on a once highly-respected independent coach operator, Straws of Leicester, recreated by a newly-restored Plaxton-bodied AEC Reliance. with a number of its entries into the British Coach Rally. DAVID JUKES braved the elements at this year’s Worthing Bus Rally and Running Day. Arriva Midlands’ Tamworth bus garage celebrated its 90th birthday with numerous visiting buses, as photographed by SHANE ROSS. provides invaluable advice to help achieve that perfect finish. is presented by DAVID JUKES. anniversary as NICK LARKIN discovers. A nostalgic look back at this much-missed one-time municipal operator. on 15-17 June 2018. SIMON GILL describes the planning and action. Running Day provided a bumper turnout of vehicles, some of which were photographed by STEPHEN WREN and DAVID JUKES. A Bristol LWL on Dartmoor. The Hershey, Pennsylvania-based Museum of Bus Transportation’s 2018 Spring Fling was held on 2 June, as MIKE GREENWOOD reports. 50th anniversary of its founding as the Eastern Counties Omnibus Society. DAVID JUKES finds out more. recently returned to action as described by ASHLEY BLACKMAN and SIMON WILES. in 7mm, 4mm and 2mm scales, as defined by NIGEL APPLEFORD. humour — and Hampshire’s longest serving bus. NICK LARKIN reports. 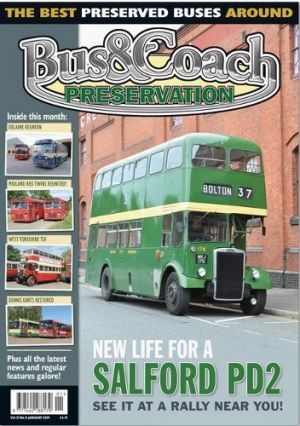 Iconic Ribble Leyland Atlantean coach restored and returned to the road. PHILIP LAMB reports. touring coaches. We take a look at them all . . .
DAVID JUKES presents this month’s selection of active senior buses. 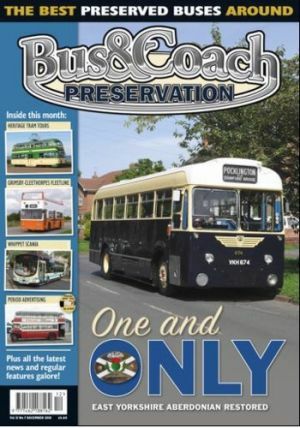 District Bus Preservation Society’s collection. HUGH JONES visits this year’s Barry Festival of Transport. 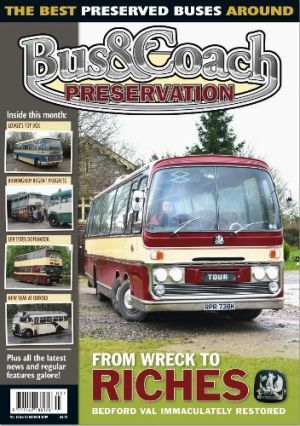 The Cardiff Transport Preservation Group now has two former Cardiff Leyland Lynx in its collection. PHILIP LAMB reports. for Leylands, Guys and Daimlers, and you have almost a full set! single-deckers new in the 1950s. with electrical guru MALCOLM GREEN. future king dropped unexpectedly into Delaine’s depot. NICK LARKIN reports.